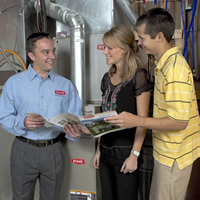 Heating and cooling are two of the most important concepts of home ownership. In fact, heating and cooling systems are major factors for those looking to purchase homes, and are a critical aspect of comfortable indoor living. You may frequently hear the term "HVAC," which is used to describe home heating and cooling systems. The acronym stands for Heating, Ventilation and Air Conditioning—which are the 3 primary functions of a home system. They control air temperature and humidity, and maintain the quality of the air in the home. A central heating and cooling system produces warm or cool air in one central area and then distributes it throughout the home. There are many types of systems that work as central systems, from traditional split systems to packaged product systems. Whole-home air conditioning systems are central systems that rely on ducts to deliver cooled air throughout the home. An air-conditioning system provides cooling, ventilation, humidity control and even heating (if using a Heat Pump) for a home. Air conditioning units cool refrigerants like Puron® Refrigerant and Freon and deliver them to evaporator coils, over which air is then blown to be cooled and ultimately directed through the ducts throughout the home. The term "thermostat" commonly refers to any unit that controls the operation of a heating and cooling system. Thermostats are used to turn on heating or cooling systems to bring the home to a set temperature. In addition to basic temperature control, programmable thermostats can be used to program the timing of the system’s functions, which can control overall energy use and costs. A variety of type systems are available besides the CENTRAL AIR or SPLIT SYSTEMS System, There are also PACKAGE UNITS, MINI-SPLIT systems, WINDOW/WALL and STAND ALONE units. These system may only cool or can provide both cooling and heating to meet many various permanent or temporary needs. The measure of efficiency by which the cooling process of air conditioners and heat pumps are rated. The higher the SEER number, the greater the efficiency–and therefore greater energy savings. Today, regulatory agencies require all new products to have a 14 SEER rating or better. The standard measurement of efficiency for gas and oil-fired furnaces. Given in percentages, this number tells you how much of your fuel is used to heat your home and how much fuel is wasted. The higher the AFUE rating, the greater the efficiency. The efficiency measurement used to gauge the efficiency of the heating mode of heat pumps. The higher the number, the greater the efficiency and cost-savings. 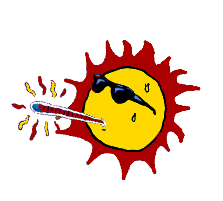 Today's models are required to have a minimum 8.2 HSPF. One additional factor that affects the efficiency of your air conditioning or heat pump system is your indoor coil (also called an evaporator coil). If your condensing unit is not matched with the proper indoor coil, it may not give you the stated SEER and/or HSPF ratings and could even develop performance problems. When you replace an existing system, make sure you replace both units so your new condensing unit will give you optimal performance, efficiency and comfort.